Nous avons passé 2 semaines à Nerja chez Madame Kennedy. Le logement est propre, agréable, au calme et on ne manque de rien. Le jardin est bien entretenu et le must est de pouvoir manger dehors et de façon privée. C’est un point de départ pour visiter la région qui au demeurant est magnifique. Je recommande vivement cette location. I thoroughly enjoyed my seventeen days in la Casita Mimosas. I was there meeting my British cousins who were also staying in El Capistrano Village. As the weather was splendid, we took full advantage of the garden for a couple of dinner parties. The kitchen was nicely equipped and light and bright. The lounge very comfortable and the bedroom was more than spacious. More storage than one could possibly need! We walked to town most days and lunched at some lovely restaurants while there. Situated in a very attractive and well maintained village location on the upper edge of Nerja. The apartment was well equipped and very comfortable with a good range of TV channels including plenty of sport. 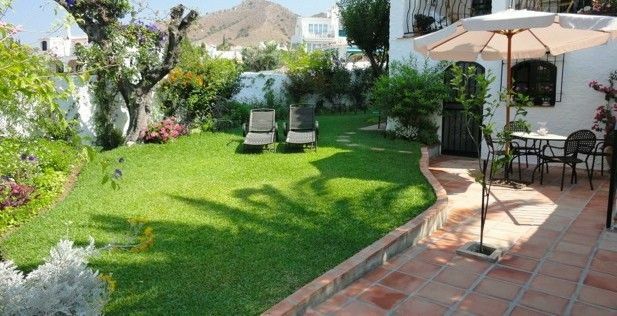 The property has a pretty garden and nice views over Nerja. Walking down in to the town each day is very pleasant and will certainly keep you fit! There is a good taxi service and good availability of coach excursions to places of interest. The centre of Nerja has a wealth of shops and restaurants, lovely views, and some very good street musicians which adds to the enjoyable holiday atmosphere. Thoroughly recommended. This unit is well located, close to supermarkets and within walking distance of Nerja town center and the water front. It is spacious, comfortable and well equipped. Initial access was easy; our stay was problem free. The apartment lies within an extensive complex which is beautifully maintained, quiet and with extensive views over the town to the Mediterranean. A great stay, highly recommendable. Glad to hear that the rather unseasonal weather did not spoil your stay and I am pleased you enjoyed the peaceful location of the property and it's proximity to all the local trail and mountain walks. Prices are for the property per week in UK pounds. Price includes water, electricity, gas, free wifi internet, linens and towels (including beach towels), housekeeping and clean linen once a week for rentals of 2 weeks or longer. (This may be reduced if long term rates are negotiated). Our changeover day is Saturday, but we are flexible for periods outside Peak and High Season. All requests will be considered.